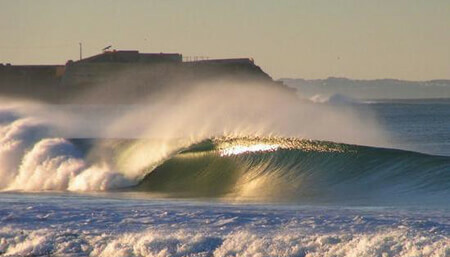 Surf in Portugal is great because of its geographical position and a mild climate. It picks up south, north and west swells bestowing the area with consistent conditions. Portuguese coast offers a great variety of swell sizes and waves which make it an ideal surf spot for surfers of all abilities. 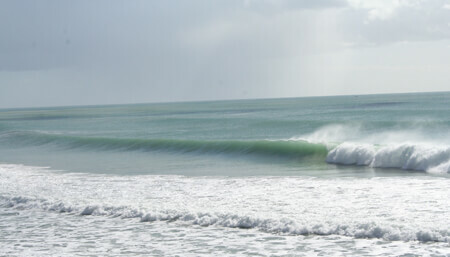 The best swells come in late winter early spring. In the winter the waves can reach around six feet (1.83m) in height and in other areas the waves reach up to 15 feet (4.57m) providing a challenge for those more adept. In the summer waves are roughly three to five feet (0.91m to 1.52m) in size. The coastline around Porto contains a number of surf spots each providing different waves suited to different degrees of surf proficiency. Just a few miles south of Porto the beaches of Espinho and Cortegaça are the most highly-regarded surf spots in the region. Surf spots can be found south of Porto in Beira where there is the largest expanse of coastline with conditions catering to surfing. The Beira coast contains a number of surf spots with the attractive village of Nazaré regarded as one of the finest spots, with extreme waves throughout the winter season. Further north, close to Figueira do Foz, Buarcos, Cabedelo and Praia de Quiaios are also highly regarded. At the peninsula at Peniche in northern Portugal along the coast, the surf conditions are extremely consistent because of its north and south facing coastline making it a fantastic place to learn to surf in Portugal. 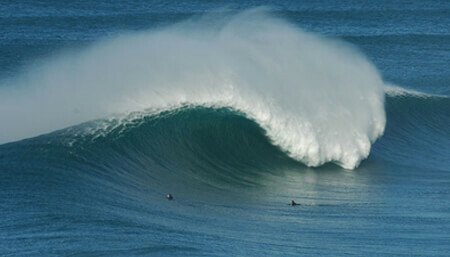 Many surfers claim that Supertubos is the best wave along the Portuguese coast, and it is rated as one of the best in Europe. It is a hollow barreling wave and only suitable for experts. A little further up the coast lays Cantinho, an excellent spot for beginners and intermediates with good consistency. Although Ericeira remains primarily a small fishing village, along the coastline there are several highly rated surf spots. 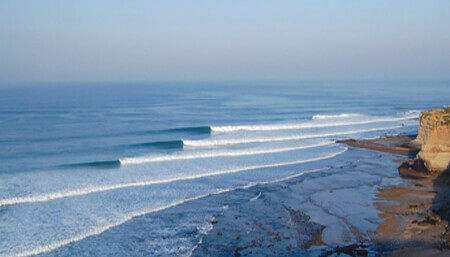 The waves found at Coxos, Cave, Pedra Branca and Reef have earned Ericeira the reputation of being one of the best places to surf in Portugal. Coxos in particular is claimed by some to be the best wave in Portugal, generating 10 feet (3m) waves in perfect conditions, although strictly for professionals! These spots tend to be crowded and the waves break on shallow reefs, so inexperienced surfers may prefer Ribeira de Ilhas which has deeper waters and is a safer surf. Lisbon is a popular place to surf, not only because of the great surf conditions but also because of all that the capital has to offer. Surfers don’t often surf at night and need something to do! Beginners can surf the breakwater and jetty while intermediate surfers can catch waves at the beachbreaks and pointbreaks. It is very easy to reach the beaches that are along the way from Lisbon to Cascais. These include Santo Amaro de Oeiras,Carcavelos, São João, and São Pedro. These beaches can get very busy, especially at weekends, but some good waves can be caught at Parede, which tends to attract fewer crowds. Further up from Cascais is Guincho, a very popular spot, although the midday high winds can sometimes make surfing impossible – best to get there early. Costa da Caparica is south of Lisbon and can be reached by crossing the 25th April bridge. This is the most highly rated surf spot in the region. 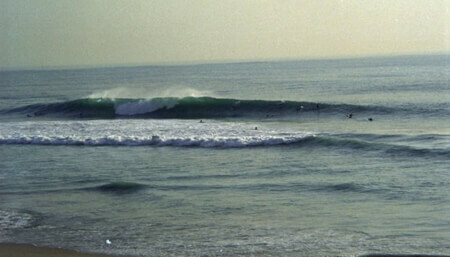 The coastline along the Alentejo offers a consistent surf in several spots including Malhão, Porto Covo, Porto das Barcas,São Torpes and Sines. Cabo de Sines is generally regarded as the best beach for beginners. The average water temperature is between 14C – 20C. The beaches can get crowded, especially during the months of July and August, but the Alentejo can be accessed easily from Lisbon. With over 20 well rated surf spots, and good weather throughout the year, the Algarve is a very popular region of Portugal for surfers. Amado, Carrapateira, Carriagem, Castelejo, Lagos, Mareta, Monte Clerigo, Praia Azul, Praia de Falésia, Praia da Rocha and Praia de Faro are all regarded as good for beginners. Arrifana, Beliche, Praia do Ponta Ruiva, Praia Zavial and Tonel tend to be regarded as more suitable for intermediate surfers. Madeira was only recently discovered by the surfing community, who has since taken to the big riders with a passion. Large Atlantic swells hit the island throughout the year, the best time being between the months of November to February. The swells are powerful and can rise and fall very quickly. 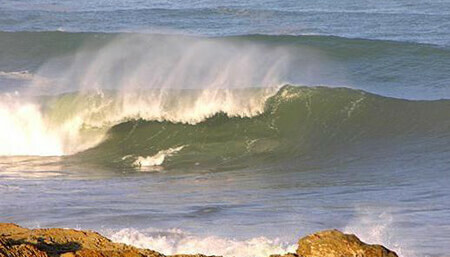 Jardim do Mar is the most highly-rated spot, with waves reaching up to 8 metres! These crashes onto the shore line and the rocky bed, making the waves suitable for only highly-advanced surfers. Ponta Pequena is also home to some spectacular waves, only hampered by being extremely difficult to access (a lot of rocky precipices to climb/walk). Paul do Mar receives most of the tubular waves to hit the island; again its rocky shoreline makes it a very tricky place to surf. 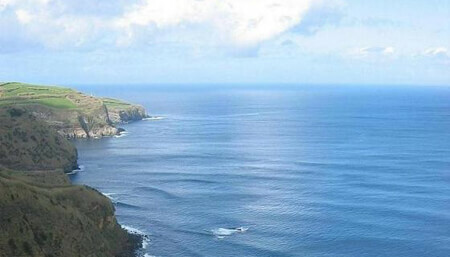 The north side of the island contains some excellent surf spots, including Madona and Bruxas beaches and Feijã da Areia in São Vicente, as well as Ponta Delgada further east. The best surf spots in the Azores are found off the island of São Miguel. The north coast of São Miguel provides a surf that is powerful, occasionally dangerous and mostly deserted. In the summer the standard surf is around 6 feet (1,83m), reaching up to 15 feet (4,57m) in the winter months. The most highly rated surf spots are Anjos, Areias, Baixa da Viola, Ponta dos Mosteiros, Populo, Praia Formosa, Rabo de Peixe,Ribeira Grande, Santa Iria. The main difficulty can be in reaching some surf spots using public transport alone, therefore car hire should be considered essential.